Bethany Homecrafts Upcycled Designs: God's Whimsy? 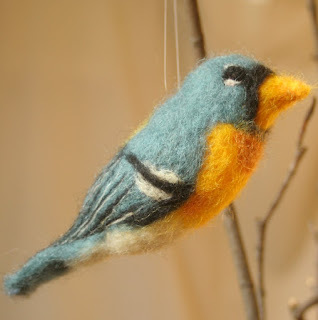 This little guy is called a Northern Parula. I've never seen one, but supposedly they do hang out in my area. I love it when I see birds (always in bird books!) that are just about every color under the sun. There must be a good evolutionary reason for this, but it's more fun to think of it as God's whimsy. Maybe God is like me and after working on a bunch of earth toned things, needed to create something really colorful! Tomorrow I will be vending at the Cultivating an Organic Connecticut conference put on by CT NOFA. I'm really looking forward to it, as I love gardening and farmers and earth and all things organic. The workshops sound great! Here's a link, in case you see this in time. Do Felted Wishes Come True?